Does Your Office Kitchen Make You Scream? 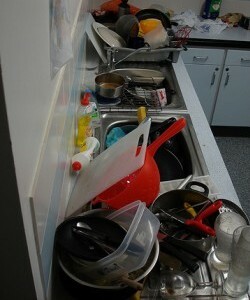 WANTED: DISHWASHERS! Former dishwasher has dishpan hands. Please take a few moments and do your own dishes. Thank you! And underneath that sign is a sink full of dirty, smelly dishes. Sure, it’s a passive aggressive attempt to get everyone to take responsibility for themselves. I’m no where near a neat freak, but my sink at home never looks as gross as the one at work. So why do we suddenly get lazy when we walk through our office door? Why can’t everyone just take care of their own things? Too busy? Please. Lazy is more like it. If your office kitchen is anything like mine then your refrigerator and microwave really need some TLC. And the floor? Forget it. Who wants to get out a mop or vacuum cleaner at work when they hate to do it at the office? No one. Not even me. We even have a guy at work (not naming names—you know who you are) who leaves the doors on the cabinets open. Never in my life have I seen anything so…so…ridiculous from a grownup. Drastic measures need to take place here—and maybe at your office too. I’ve devised a plan on how to cut the clutter out of our kitchen and I’d like to share it with other people who may be having the same problem. It should be someone’s job on Friday to empty the refrigerator of all perishable items. That means the ketchup, yogurt, and salad dressing can stay, but the grapes, lemons, and sandwiches will go into the trash. It might be a good idea to put a sign on the front of the fridge at eye-level so coworkers won’t be surprised. Of course there will be moaning and groaning that someone threw away a scrumptious piece of pie or something…but a rule is a rule. Be consistent and the rest of your coworkers will learn to adapt. If you have the capacity to install a dishwasher—even if it’s one of those really small ones meant for studio apartments—think about it. Of course someone will have to move those dirty dishes from the sink to the dishwasher, put the soap in, turn it on, then empty it, but at least people won’t have to deal with the smell of dirty dishes and the fruit flies that come along with them. All cups and mugs will be taken from the office and given to Goodwill. Put the word out because there will be people who keep special mugs in the kitchen and if you bring their “Greatest Dad in the World” mug to Goodwill, then God help you. In their place go paper mugs. I know what you’re going to say. Ceramic mugs that you can wash are more environmentally friendly than ones you throw away. And I agree with you. But unless you want to wash all of the mugs at the end of the week, something needs to give. And I’m not talking about having non-biodegradable Styrofoam coffee cups, I’m talking about offengri cups that can be recycled. Even better if the cups are made from recycled materials. Raise your hand if you like to handwash utensils that have been in the mouths of people other than your immediate family. Yeah, thought so. Get rid of the cutlery and get plastic silverware for the office—preferably stuff that is made from cornstarch because it is biodegradable. You can buy a whole stack of them and not feel guilty about throwing them in the trash when you’re done. Go paper for your plates and bowls, too. Again, try to go for the recycled kind and up your good karma. Instead of keeping soggy sponges around—they breed germs—get some canisters of cleaning wipes from a green company like Green Works that you can easily find at your grocery store. Their cleaning wipes are 99% naturally derived and can be composted. If you can talk your boss into hiring a cleaning service, do it! That way you know your kitchen will be clean, appealing, and germ free once a week or twice a month. Not only will you be able to count on having a clean kitchen you’ll have happier employees. You can only avoid your nasty kitchen for so long before it becomes smelly—which not only causes a disgusting (and potentially infectious) work environment for everyone in the office, but it doesn’t make a good impression on visitors. And if having a client walk into your filthy office kitchen for a napkin or, god forbid, to heat up his cup of coffee in your microwave is a potential embarrassment, you should do something about it. If the employees at your office are anything like the employees at mine, they are hard working, devoted, smart, and busy people who might not really be slobs in real life but are slobs at the office. Help them out by making things easier in the kitchen so everyone can reap, and enjoy, the benefits of a cleaner environment. nice suggestions. My office is just the one of those you mention, I admit it. thanks for the post. Lazy bastards having no respect for themselves or for the others…bad basic education. Not too many people were grown by their parents, but by tv’s. come on! paper this, plastic that, throw away everything??? really? just wash your crap!